A newly discovered penguin fossil reveals a bird twice as big as an Emperor penguin and with colors radically different from the familiar black and white features all modern penguins share...but this Water King was already the perfect swimming bird. The fossil was discovered in Peru and has been classified as Inkayacu paracasensis, but its less formal name is Water King. 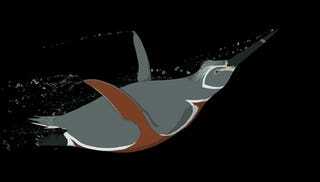 It's not hard to see why - at five feet tall, it was twice the size of the largest living penguin. Of course, we might not immediately recognize this bird as a penguin, at least if we're going strictly by the familiar tuxedo-like colors of its descendants. Instead of a black and white plumage, this penguin had a mix of reddish-brown and gray feathers. The color of the feathers might seem like a relatively unimportant detail, but it actually provides crucial insight into how penguins developed. While its colors were different, the structure of the Water King's feathers were identical to those of modern penguins. The wing feathers were densely packed together to form the stiff, narrow flippers so crucial to swimming, while the body feathers possessed streamlining structures that also aid in swimming. This means he structure of the penguin feathers evolved very early, but it was significantly later than penguins developed their traditional feather colors. Feather colors are created by tiny structures called melanosomes, which can create many different colors depending on their size, shape, and how they're put together. Researchers have built up an extensive library of melanosomes and what colors they produce, and this allowed them to reconstruct the color of the Water King's penguins. Unlike the Water King and all other birds, modern penguins have giant melanosomes much bigger than any others found in nature. These give them their distinctive colors, but the fact that the Water King didn't have them suggests they didn't evolve strictly to help with swimming. Researchers speculate these helped penguins camouflage themselves from seals and other predators. "Insights into the color of extinct organisms can reveal clues to their ecology and behavior. But most of all, I think it is simply just cool to get a look at the color of a remarkable extinct organism, such as a giant fossil penguin."